Etsy has been hanging over me for a while now. I kept putting off taking the plunge, due to self doubt about my ability to get just the right photos and my ability to still be excited about the work I did a month or two ago, or my ability. Period. I also felt like I had to have enough pieces to make them worth listing without looking like a lame little shop of three items. Well, tonight I have fulfilled one of my big New Year’s resolutions, and my ETSY shop is underway with a whopping 3 items! Yes, it is a big learning curve. I realized that I have quite a few pieces to list and I worked on writing some descriptions this afternoon. Then I took some photos before the light was gone. I’m not especially happy with the background that I used, but hey, I don’t have to use it next time. I’ll learn. As I nervously listed my first item, and moved on the the photo upload section, again a photo snafu. My photographs were too big. Too many pixels. I needed to resize. WHAT?? I could find nothing in my iPhoto program that said anything about resizing. Argh. On to Photoshop, with which I am much less familiar, and I finally figured out how to resize my photos to fit the Etsy format. By the time I got to the third pair of earrings I was getting the hang of it. It was taking less time. The hard part now will be not to read and reread and judge every little thing I have written. To just keep moving forward with conviction. It is a little like our Dip of the Month Club here on the island. 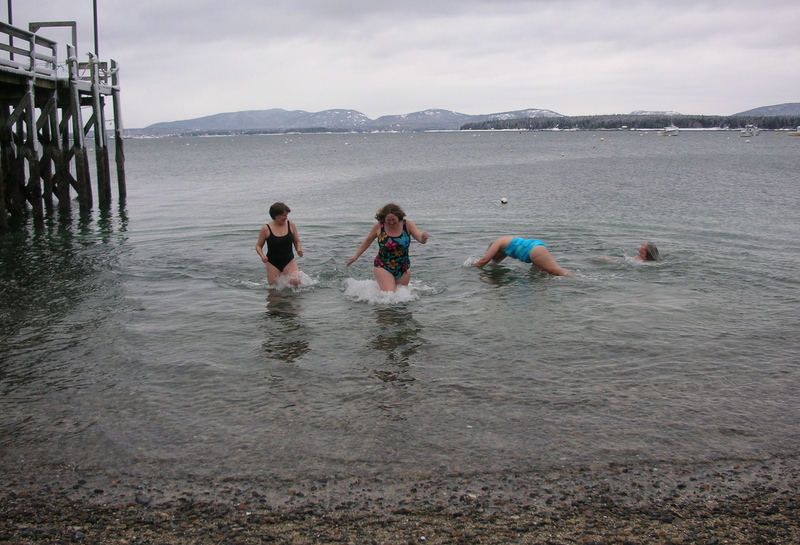 You can’t think about it too much before going in the water, or you’ll never be brave enough to go in. Especially in January, February, or March. 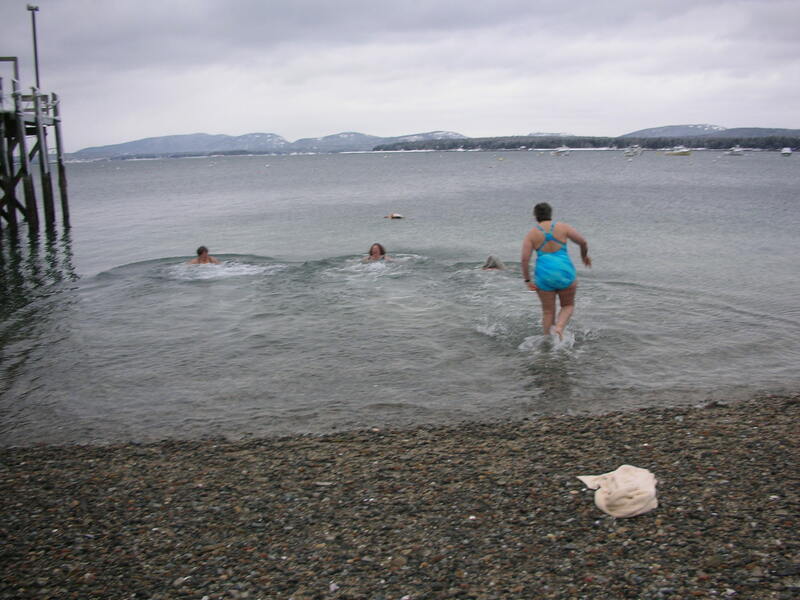 These photos were actually taken in January, 2 years ago, but 4 of us just went for our January 2010 dip last week. The water was about 40º. Everyone in this photo has been going in for a dip, once a month, for over 7 years. It still cracks us up! While I was busy jumping in to Etsy tonight, my dear friend Holly was taking the plunge into our “rivet challenge.” She has succeeded with a truly inspiring pendant using tube rivets. Wow, Holly! Bring on more rivets! Your designs never cease to amaze me. i found it! it’s beautiful! PERFECT writing and the background’s great too! Congratulations! jan 20 was a big day for both of us! big hugs! Congratulations Barb. I agree with Holly. Everything is perfecto mundo. You go Girl!